The Croozer Designs cargo bicycle trailer is a eco-conscious, human-powered hauling alternative to cars or trucks that uses a cyclist’s own pedal power to transport small to medium sized loads. 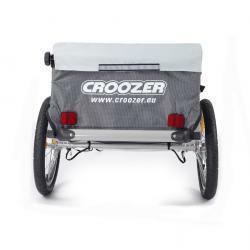 The trailer is two-wheeled, lightweight, and quickly and securely attaches/detaches to and from virtually any bicycle. 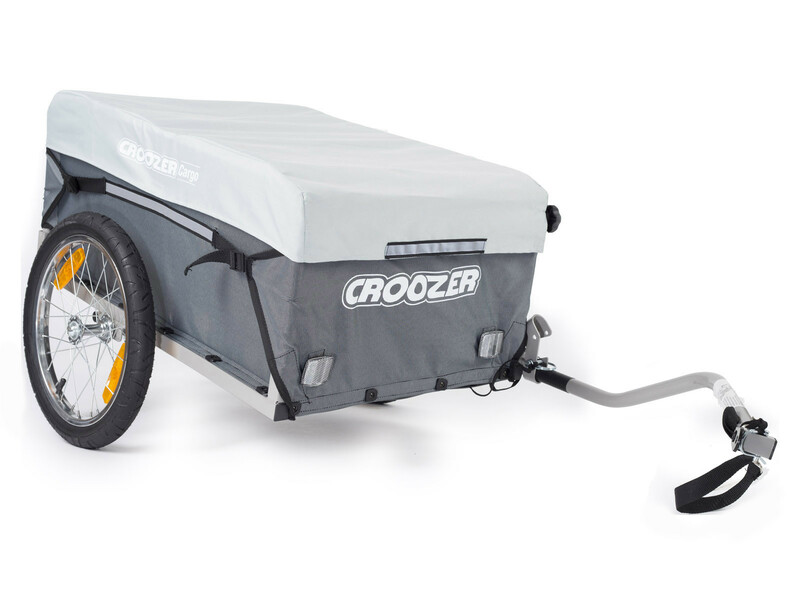 Additional features include, a secure hitch / drawbar connection to bicycles, tool-free assembly and disassembly using included knobs and spring clip bolts,* a removable Velcro-attached rain cover, built-in reflectors, handcart functionality and fold away storage. 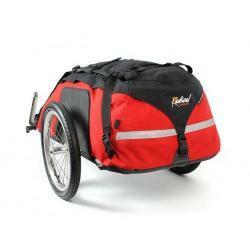 Use only a bicycle and your own cranking power for your hauling needs. 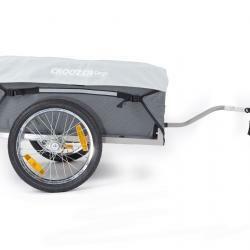 Leave your car behind and get some exercise as you choose a pedal-powered option using your bicycle to get your hauling done. 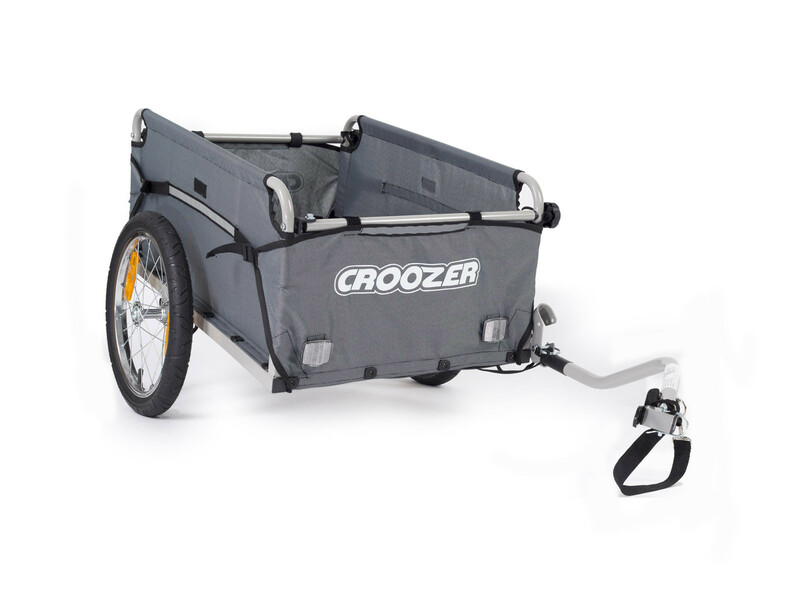 The Croozer cargo bicycle trailer is a 30.5″ (l) x 19.5″ (w) x 13.5″ (h) platform supporting up to 66 lbs of cargo, that attaches to the rear axle of any bicycle, providing plenty of space for groceries and running routine errands. 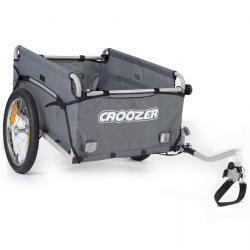 Accommodates up to 66 lbs on two spoked wheels. The Croozer Designs cargo bicycle trailer body consists of a single piece cargo section composed of rugged steel tube framing interwoven within weather-resistent side walls. This in turn is connected to a solid plastic floor. The lengthwise frame tubing sections, with the connected side walls, fold up and down from the floor section. 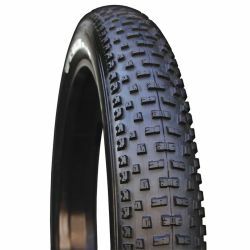 When the side walls are in the up position, additional tubing sections swing out at a 90-degree angle, where they connect to the opposite side wall, and are held in place with an included star-shaped knob. 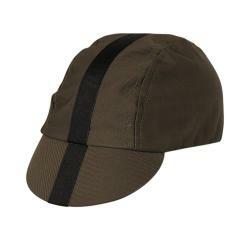 Tautness of side walls can be adjusted with integrated exterior straps. The included weather cover is fully removable, and utilizes Velcro connections and proximity to knob structures to stay in place. 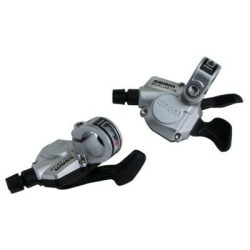 All assembly and disassembly are done without the use of any tools. 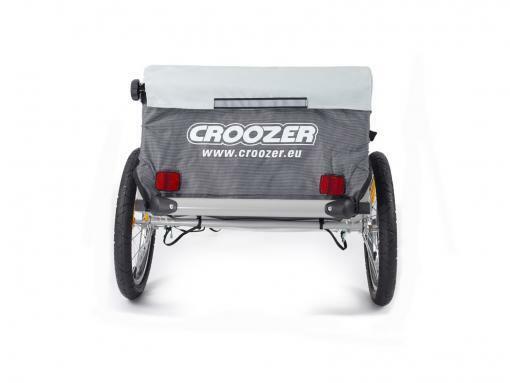 The trailer contacts the road via two 16″ spoked wheels, which are fitted to the trailer with included clip bolts, which slip through the wheel axle and are fastened in place with a spring section built into the bolt. 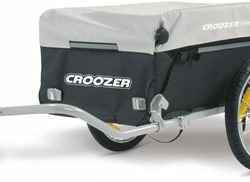 Bolts are also connected to the trailer with straps, which ensure that they will never be misplaced, even when wheels are removed. 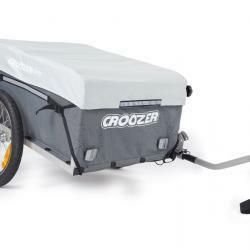 The trailer connects to a towing bicycle by a combination of a metal hitch that attaches to the rear axle of the bicycle wheel, and a single rugged drawbar with a coupling element at its end. 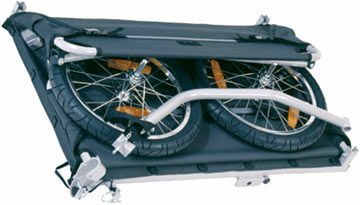 Both the hitch and the drawbar are left-aligned, attaching to the bike, opposite the rear derailer. 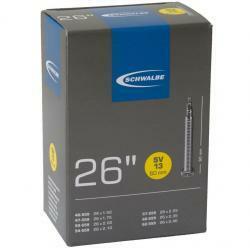 This eliminates the possibility of trailer interference with the shifting of bicycle gears. 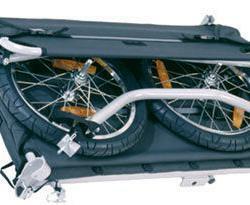 The hitch is semi-permanently mounted on the rear axle, and is compatible with both axle nut and quick release hub configurations. The coupling at the terminus of the drawbar slides over the hitch and is secured with a spring bolt clip. The bolt is strapped to the drawbar, so it will never be lost when the trailer is removed. 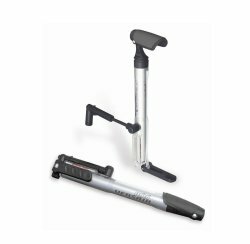 The drawbar also has a safety strap connected to it that wraps around the bike frame. 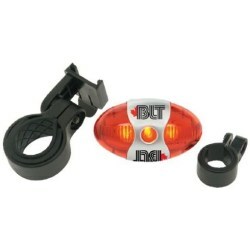 This ensures a connection to the trailer in the unlikely event of the drawbar disconnecting from the hitch during use. 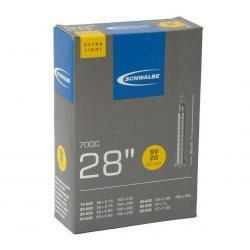 The drawbar section just below the coupling is flexible, providing smooth pivoting into turns. 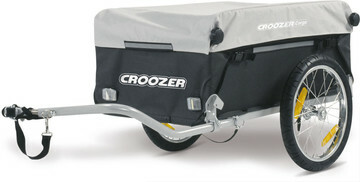 The connection point of the drawbar to the trailer has two setting. 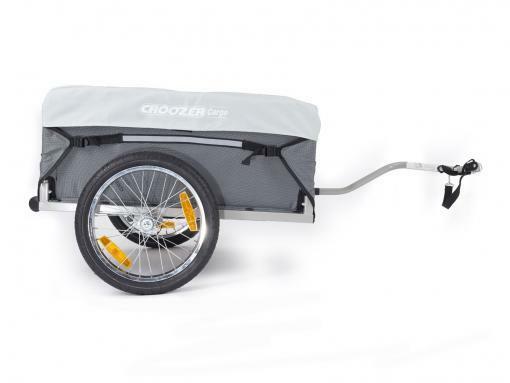 The standard level setting is for use when towing, while the additional raised setting — altered with its spring clip bolt — conveniently allows for use of the trailer as a hand cart when away from bicycles.